Let me get something straight. Under normal circumstances I would consider my co-host, Adam Gori, a friend of mine. However, when that so-called “friend” gets an 80-yard garbage point touchdown and wins our matchup by six points I’m forced to reconsider our relationship. That’s what fantasy football can do to people. That’s exactly what Prime Time Fantasy Football is for, folks. We give you all the advice you need so you don’t even have to worry about being garbage points-ed to death! 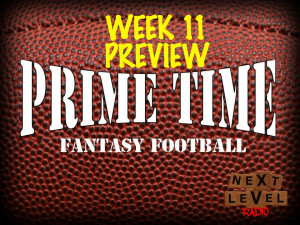 On the Week 11 preview show of Prime Time we have four, count ’em FOUR, listener questions to answer. Trust me when I say each one was better than the last. We also have some good topics of conversation in our game previews, which include Ronnie Hillman, Blake Bortles, and Michael Crabtree. Plus, per usual, we’ll give you some picks in Show Me The Money and offer the best stats around in our Fantasy Facts of the Week.